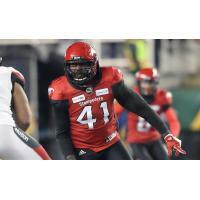 The Calgary Stampeders have re-signed international defensive lineman Cordarro Law. Law made nine starts for the Stamps at defensive end during the 2018 regular season and recorded 16 tackles including two tackles for loss, four sacks and one forced fumble. He started both post-season games and recoded a total of five tackles. "When he's been on field during his time with the Stampeders, Cordarro has been a disruptive force," said Stampeders president and general manager John Hufnagel. "He's an important part of our defence and I look forward to seeing him have a healthy and productive season in 2019." Over two different stints in Calgary, Law has played 31 regular-season games and recorded 22 sacks. He also has 73 tackles including eight tackles for loss, two forced fumbles, one fumble recovery and one knockdown. Before rejoining Calgary in 2016, the Southern Mississippi alum played 17 games for the National Football League's San Diego Chargers.